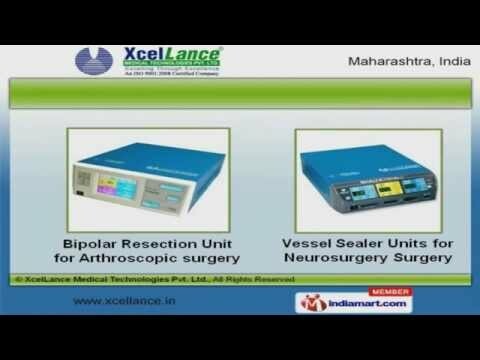 Welcome to XcelLance Medical Technologies Private Limited, Manufacturer and Exporter of Medical Equipment. We are an ISO 9001:2008, 13485:2003 CE certified company, established in 2008, at Navi Mumbai. We are Member of Pharmaceutical Export Promotion Council. We are backed by Customer centric approach and Quick after sales support. Escorts Hospitals and Lilavati Hospital are some of our esteemed clients. We are instrumental in offering a wide array of Electrosurgery Units, Accessories and Vessel Sealer Units. Our product list covers Vessel Sealing Accessories and Saline Plasma Bipolar Resection that are extremely reliable. Surgical Cautery Machine for Hospital offered by us are superior in performance. Our Bipolar Resection Unit for Arthroscopic surgery are widely acclaimed in the market. We also provide Electro Surgery Units that are available at industry leading prices. Along with that we offer Saline Plasma Bipolar Resect that are best in the industry amongst others.